Okay, I am making this sound like a snooty and unapproachable food. But it’s actually the EASIEST! And the cheesiest and ooey goooey-est. Which is why I’m teaching you how to make it! They are full of antioxidants! Meaning they help keep your body systems healthy and can help ward off disease that can damage cells. Figs can help support major body systems to fight off common illnesses. The fig and its parts have been used for centuries for this purpose. Studies have shown figs to support health issues with anemia, diabetes, liver problems, skin diseases, gastrointestinal tract and urinary tract infections, and many more! They are immune boosters, with antimicrobial and antifungal properties There are studies that have shown the effectiveness in the ability of figs to increase immune system response. Figs are full of nutrients and minerals. Specifically fiber and magnesium. 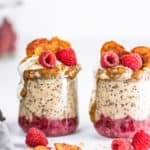 Fiber is essential for keeping a healthy digestive system. 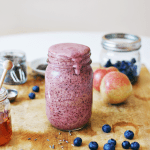 And what happens when our gut is healthy? The rest of our body benefits, especially mental health and even thyroid function. All disease, and healing, begins in the gut! Magnesium is an essential mineral, which the body needs for proper thyroid hormone production. Costco! 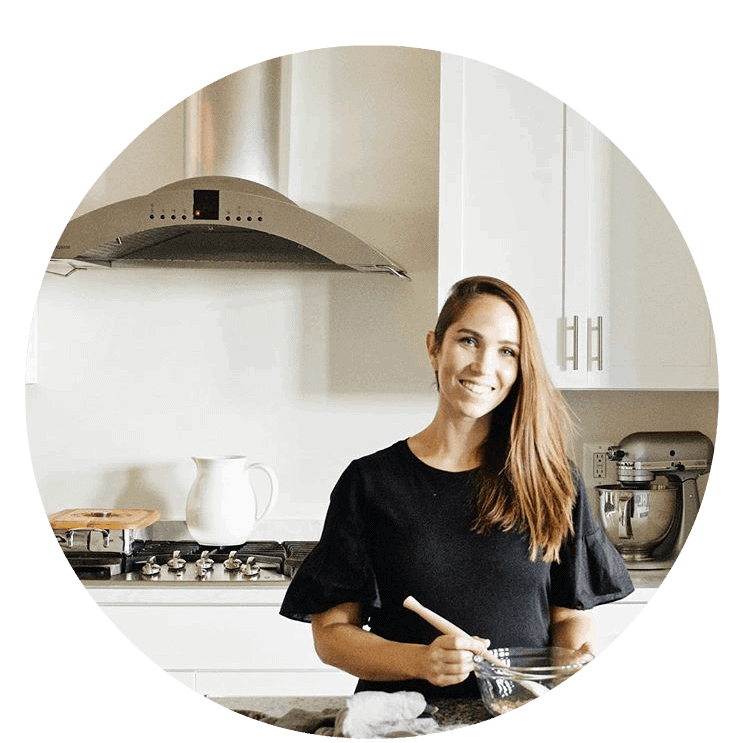 It is the one and only place you should buy your brie. (But isn’t Costco the solution to most of life’s problems?) It comes in a charming wooden wheel, and it’s only $4.99! Cannot beat the quality and quantity for that price, my friends. Look at that! Ooey-gooey perfection. See why it’s in my top ten? I bet it will end up in yours, too! 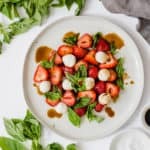 Love easy and tasty appetizers? Check out my exceptionally popular goat cheese dip with basil and honey! 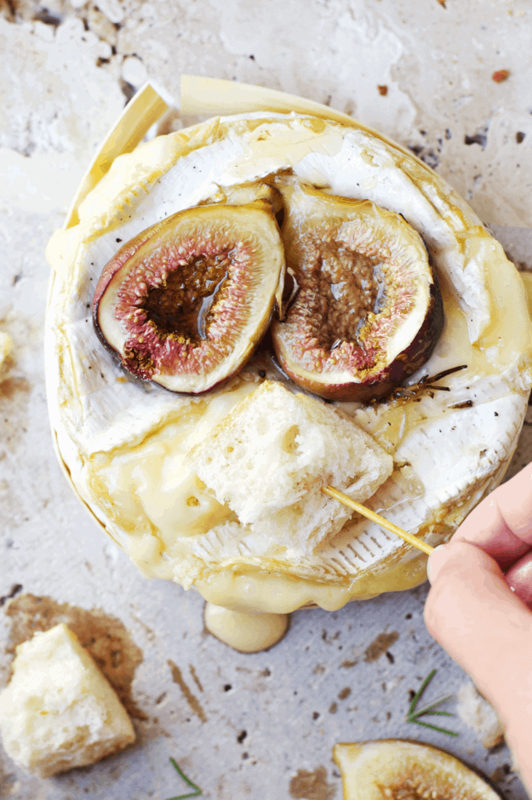 Alrighty, go grab the recipe for baked brie fondue with roasted figs and honey below, and ENJOY! 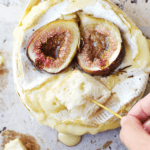 Make this baked brie fondue with roasted figs for an easy and delicious appetizer. It has many health benefits from figs. Cover a baking sheet with foil. Cut figs in half and line on the baking sheet. Drizzle with honey and roast on 350°F for 25 minutes. 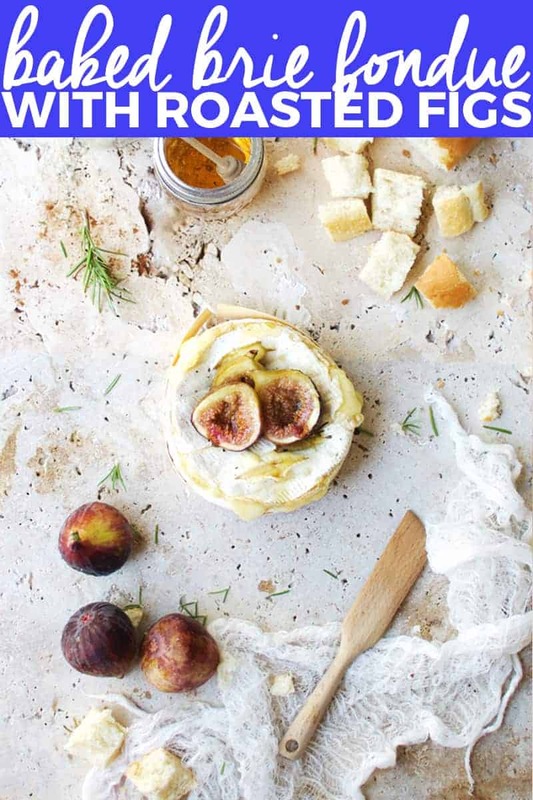 While figs are roasting, prepare the Brie. Remove it from its wrapper and place back in the round container. Using a sharp knife, make 4-5 slices in the rind. Cut the rosemary sprigs into one-inch pieces, and stuff in the slices. 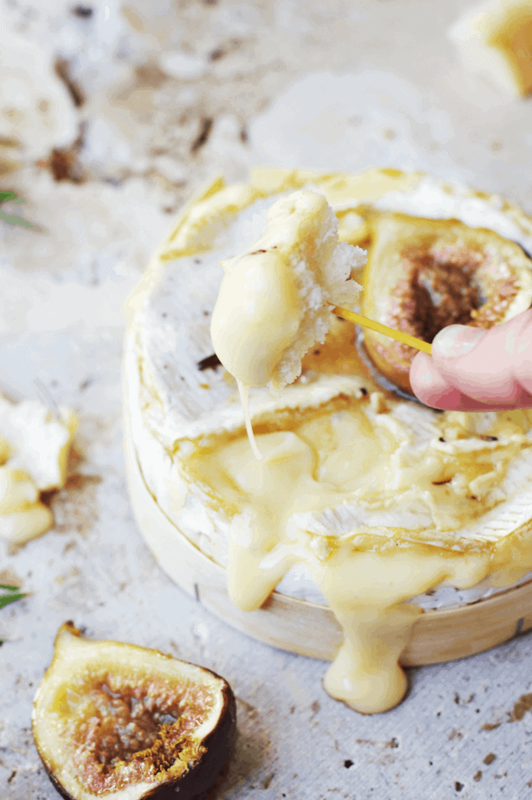 Place the Brie on a baking sheet lined with foil. Drizzle with the olive oil, honey, salt and pepper. Once the figs are finished, preheat the oven to 425°F. 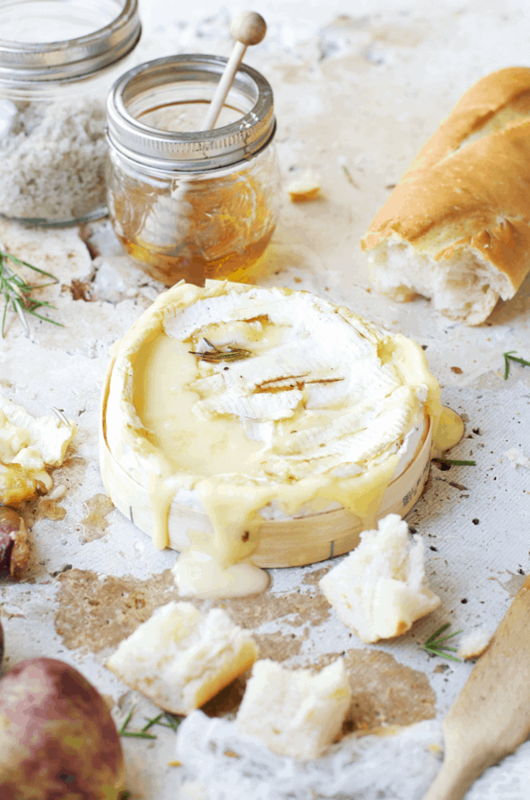 When ready, place the Brie in the oven and bake for 10-12 minutes until the cheese is melted and slightly bubbling. Remove the Brie from the oven. Take a sharp knife and slice around the edge of the rind to allow the cheese to come through. Place 3-4 figs on top to let the juices infuse into the cheese. Add another drizzle of honey if desired. Dip into the cheese with crackers. 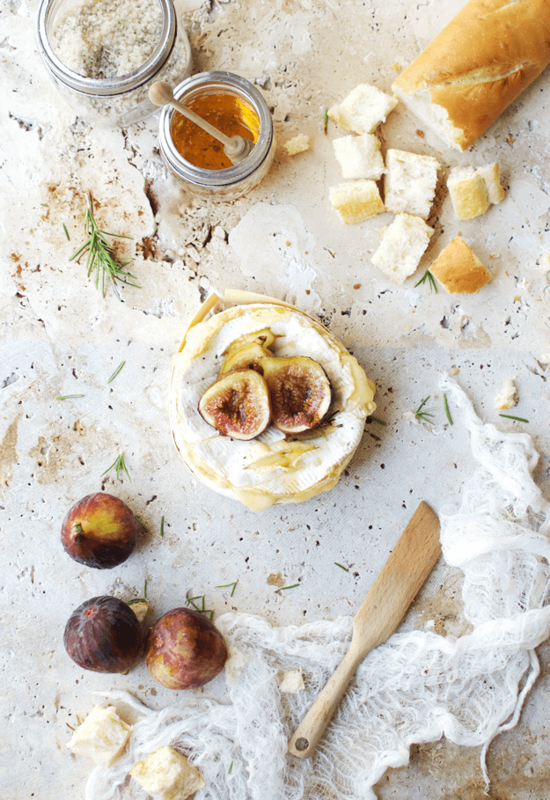 Slice up the remaining figs and eat with crackers (or bread) and melted Brie. Enjoy!